Now onto Aladdin Sane (1973). Yes, my listening to these was prompted by this conversation. Listening to Beatles For Sale . Currently Kansas City /Hey Hey Hey Hey is playing. I said bye, bye bye bye bye bye bye, bye bye baby bye bye! on repeat again and again..
Black Tie White Noise - my favourite 90's Bowie album. Am: I'M BETWEEN ALBUMS AHHH I CAN'T FUNCTION I may have to join you, Fiddy. Same here, I'm doing math homework as we speak type. Also, for the record, the best homework-doing album is indisputably Rubber Soul . I'm listening to Anna Von Hausswolf's Dead Magic, an album from last year. It's awesome, it's very atmospheric and moody with most of the songs played on organ. Kind of like a medieval album if I ever heard one. Hmm, is it? I'll have to try it. I typically use it for needing-to-feel-groovacious times rather than needing-to-prevent-my-soul-from-withering-under-the-weight-of-schoolwork times. It's very good for that second one, it's saved my soul from withering a great many times. Also it's extremely amazing, but you knew that already. 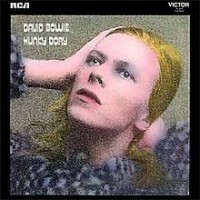 Actually, I think I'll listen to it right now, it's been far too long and Hunky Dory just finished. I think by this point "doing a Fiddy" means "replying to a post and having something (like another post or the top of a new page) getting between them" so yeah. ATMP , as I suffer through my chemistry homework and try not to think about the piles of math that await me. So I don't know why, but I am O B S E S S E D with I Live For You. It's just... so... perfect. Definitely in the competition for Favorite Harrisong. This. I'm not sure why but it's interesting. Now it's Please Please Me .